When I first saw Mumford and Sons on Saturday Night Live recently I wasn’t sure what to make of them–which is my fault not theirs. They seem like a throwback to an acoustic bluegrass-folk-rock sound. No synthesizers, sequencers or drum machines, just acoustic guitar and bass, piano/organ, banjo and dobro, a horn section, sing-song group vocals, and a lead singer/guitarist, Marcus Mumford who doubles as a drummer by playing a steady kick drum while standing up and fronting the band. The music is raucous and raw, harmonious and celebratory, but I wasn’t listening too closely–in part because I was staring at the TV wondering if Mumford’s shin muscles might be getting sore from playing that kick drum! 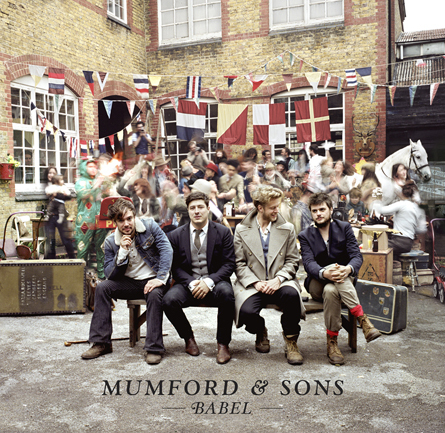 One of the band’s most streamed songs is “I Will Wait”, track three on Babel. The song is uptempo with a 4/4 thumping groove and tightly structured as a series of verses as choruses. The verse is a I-IV-V progression over 8 measures. Nothing special here, music-wise, but it sets the song’s reassuring tone. The music soon opens up with the pre-chorus section, which is a vi-v(6)-I-IV-iii-V progression repeated twice. There are twice as many chords in this section as there are in the verse and chorus in about the same number of measures. The phrase “And I’ll kneel down” gets the first three chords as support, lending the section a sense of motion–maybe a musical representation of literally kneeling down?–and a movement towards that last V chord which will lead dramatically back to the I chord that begins the chorus. The chorus is a I-iii-V progression. That second chord is minor and adds a little melancholy to the chorus’s otherwise boisterous feel. The iii chord hits just as Mumford sings “you” at the end of the line “I will wait for you.” Simple but poignant, and the words gain power as they’re repeated. Much of Mumford and Sons’ music alternates between whisper intimate verses and rousing, bellowing-in-a-pub choruses. “I Will Wait” makes good use of these shifting dynamics to build and release tension. There’s an urgency and intense emotionality to the song which is transmitted through the steady streams of 16-note guitar/banjo strumming and plucking that supports Mumford’s gruff singing. The music sounds old-fashioned–built as it mostly is out of this strumming, plucking, and the rousing vocal harmonies. Rhythm parts don’t come from drumming as much as from the group’s collective thrum. Mumford make use of careful arrangements too. Sometimes the instruments drop out, strumming limited to the downbeat so the vocals can shine a capella-style. The music sounds live–as if we’re all down at the pub singing and sharing our stories with one another, pouring our hearts out over beers. There are even tiny tempo variations that reinforce Mumford’s authentically live sound. If you have Babel, listen very closely from 2:06 to 2:15. At the end of the second repetition of the chorus–right around 2:11-2:13–the tempo drags ever so slightly for a brief moment. I first noticed this a few weeks ago and couldn’t put my finger on the problem. It’s so subtle as to be almost unnoticeable, but if you tap your foot along from the first time around the chorus you might catch it. You can’t quantize this kind of thing because the whole band is playing together. And maybe it’s not something you’d want to “fix” anyway. After all, it’s little quirks like this (what the ethnomusicologist Charles Keil once called “participatory discrepancies”) that let us know that the music was recorded live. I listened to the song again as I was editing this blog post and snapped to attention at 2:13 while not aware that I was even paying attention to the time. So why is Mumford so popular now? Finally, listening to Mumford has me thinking about musical style and how style usually changes quite gradually. It’s for this reason that the sound of the pop charts is quite homogenous–different songs by different artists (is “artist” even the appropriate word in this era of think-tank songwriting?) each having a similar feel and texture. Because of this, the sound of contemporary pop will seem like a static thing for a long while. As if in a game of Copy Or Perish, everyone uses similar sounds, similar beats, similar lyrical gestures to keep up with one another until…Someone comes along and does things differently. Maybe Mumford’s success will prompt a stylistic tipping point, or maybe not. Maybe they’re just a one-off–too much “rustic troubadour” to copy. Besides, one thing to remember about musical style is that homogeneity often coexists with fractionalization: there is a niche for every style that can make a case for itself. And in this regard at least, Mumford and Sons succeeds. 1. Listen to a bit of everything. I do this all the time. It’s exciting but glosses over the details. 2. Listen to nothing. If nothing else, this is a good way to cleanse the ear palette. 3. Listen to one thing over and over for a while. This allows me to notice and obsess over details and also hear the music as a model of a social world. Listening to a music over and over helps me hear the world through the feeling of this one style, this one group, this one song.